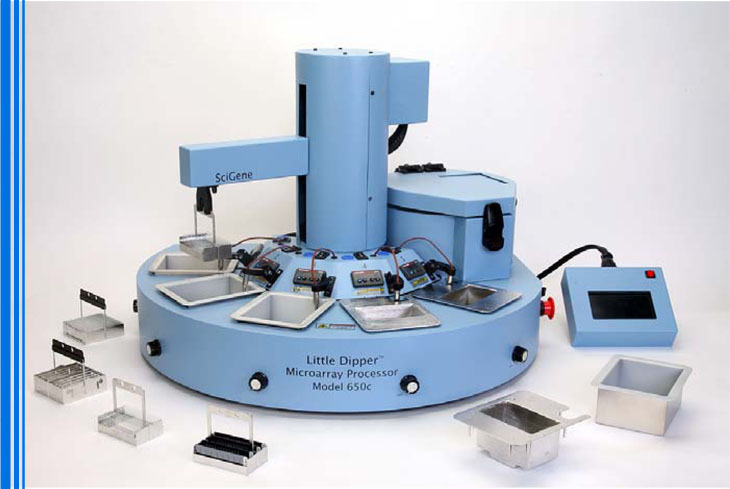 The SciGene Little Dipper Processor for Agilent Arrays [Ord. #1080-40-2 (220V)] is a programmable robotic system that replaces the multistep manual processes normally used for post-hybridization processing of CGH, gene expression, ChIP-chip and miRNA arrays. Batches of up to 12 slides are moved at programmed times between temperature controlled baths containing Agilent wash buffers and solutions. While submerged in each bath, arrays are reproducibly washed using a combination of up/down agitation and stir bar vortex action. After the washing steps, arrays are air dried or coated with a stabilization solution using a slow withdrawl of the rack from the final bath as specified by Agilent. After filling the baths and setting the buffer temperatures, arrays are removed from the Agilent hybridization chambers and placed in a simple to load, 12 position rack. After inserting the rack onto the Little Dipper robotic arm, the instrument performs all of the processing steps following programmed times and agitation rates. The simplicity of the design and operation of the system makes training a snap. For new users, a handy operator reference card is included that guides them through system operation. The Little Dipper for Agilent Arrays comes fully outfitted, ready to use for processing Agilent CGH, gene expression, ChIP-chip and miRNA arrays. The system arrives with all necessary components and with Agilent recommended protocols installed. Just follow the reference card, fill the baths with the Agilent buffers, press start on the control screen and load the rack of arrays. The instrument does the rest. The Little Dipper Processor can be easily configured and programmed to perform all commercial and self-spotted array processing protocols as well as FISH procedures. An Upgrade Kit for Illumina® BeadChips (Cat. #1080-31-0) is available. Ozone in lab air destroys signals from Cy-5 and other fluorescent dyes used in microarray studies (1). The NoZone TL Workspace is a sealed, acrylic enclosure with filtration equipment that creates an ozone-safe environment for working with microarrays. It provides sufficient space for the Little Dipper Microarray Processor or Agilent DNA microarray scanner. Easily assembled, the enclosure seals to the lab bench and has two hinged doors that swing to either side to allow full access to the internal work area. The NoZone Ozone Scrubber completes the system. (1) Effects of Atmospheric Ozone on Microarray Data Quality. Fare TL,et al. Analytical Chemistry 1;75:4672-5.